Much has been written about Peter Jackson’s decision to expand Tolkien’s The Hobbit into a trilogy of films, with more than a few considering it a cynical, opportunist move. After the first instalment, An Unexpected Journey, confirmed the fears of many, underwhelming and feeling unnecessarily drawn out, The Desolation of Smaug faced a tougher task. It is two-and-a-half hours of act two, with no beginning and no end. The film starts with a flashback: a meeting in a busy pub between Gandalf and Thorin, in which the wizard convinces the aspiring dwarf king to take a hobbit thief named Bilbo Baggins on his quest to reclaim the abandoned kingdom and gold of Erebor. Fast-forward and we pick up where An Unexpected Journey left off, with our band of brothers continuing their journey towards the Lonely Mountain. On their way they will be persued by Orcs, trapped by giant spiders, taken prisoner by the woodland elves of Mirkwood and gain allies in the people of Lake-town, all before finally reaching their destination and coming face to face with the terrible dragon, Smaug. The good news is that The Desolation of Smaug is a vastly superior film to its prequel – though, of course, that doesn’t take much. While it is still a long film, clocking in at 161 minutes, it doesn’t feel stretched. Unlike the first film in which every individual scene felt too long, the pacing is much better this time around. This film has more momentum, more drive. Expanding a book that is significantly shorter than The Lord of the Rings into a trilogy of films that is every bit as long naturally requires some additions. While An Unexpected Journey was largely true to the source material, in The Desolation of Smaug this new material starts to come into play. Some of the additions come from unpublished Tolkien manuscripts like “The Quest of Erebor” while others are original ideas from the screenwriters. The most notable of these original ideas is the introduction of a new character, the female head of the Mirkwood Elven guard Tauriel. The introduction of Tauriel has two purposes. Firstly, she allows for a love triangle between herself, the handsome dwarf, Kili, and Legolas – whose inclusion in the film is another example of artistic license, and, who appears to be Benjamin Buttoning, with Orlando Bloom ten years older than when he first played the part despite the character supposedly being 50 years younger. Secondly, she brings a feminine energy to a film that is otherwise a bit of a sausagefest. The storyline is by nature episodic as our heroes progress from one location and situation to the next. It is a movie of sequences and set pieces with two specific highpoints. The first is an exhilarating chase sequence which sees the dwarves travelling down a rapid river from Mirkwood in barrels while being pursued by orcs and elves, who battle each other on the river banks. The second is the introduction of the title character, Smaug. Voiced by the world’s busiest actor, Benedict Cumberbatch, Smaug is a both an impressive piece of visual design and a complete and engaging character. Like An Unexpected Journey before it, The Desolation of Smaug has been shot in High Frame Rate 3D – meaning the camera rolls at 48 frames per second rather than the standard 24 frames – and as with the first film it is difficult to see the purpose of it (outside of the extra couple of dollars you pay at the box office to see it in that format). The resulting aesthetic is very strange. At times it feels like you are watching a videogame, at other times a digital home video. The higher definition is also incredibly unforgiving when it comes to costumes, makeup and digital effects which all look more artificial in the HFR format. 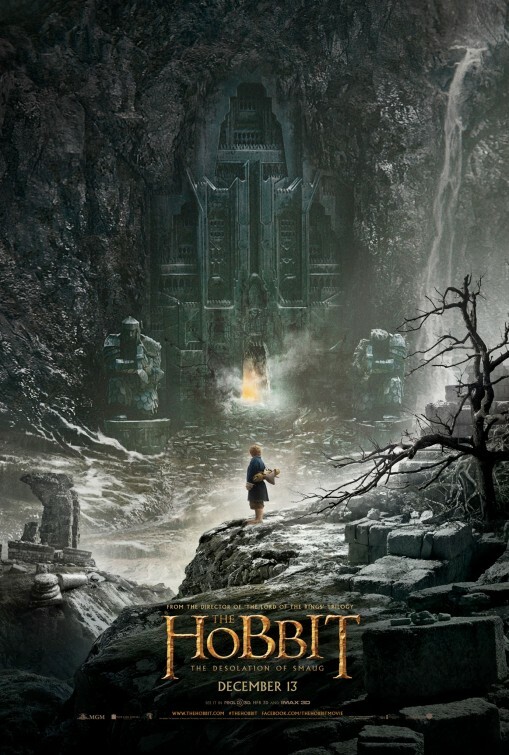 While its only being the middle of the story robs the climactic scenes of some of their power – we have to cut away from Smaug, Bilbo and the dwarves in the halls of Erebor in order to keep tabs on what is going on with other characters – The Desolation of Smaug is a step in the right direction for Jackson’s franchise. Retaining the sense of adventure which differentiates this series from the darker The Lord of the Rings trilogy, this second instalment finds the sense of momentum that was missing from its prequel. The Secret Life of Walter Mitty is one for the dreamers. It is a film for those ordinary people who wish they could do something extraordinary. Walter Mitty is such a man. His respite from the mundane reality of his life is his active imagination. He is constantly zoning out to indulge in different fantasies and “what ifs.” Walter works in the photographic department of Life Magazine where he pines after Cheryl Melhoff who has recently joined the magazine in the accounts department. On his 42nd birthday it is announced that due to the changing marketplace Life will be ceasing publication, forced to go completely online. For its final cover, renowned photographer Sean O’Connell has sent through a picture he considers among his finest ever, representing “the quintessence of Life.” However, the negative is missing and with the clock ticking Walter sets off to track down the globetrotting photographer and the mystery picture. This is the second adaptation of James Thurber’s 1939 short story, the first being Norman Z. McLeod’s 1947 film of the same title starring Danny Kaye. However, in this instance Thurber’s story – which was less than 2,000 words long – is used only as a departure point for Steve Conrad’s screenplay. The idea that the daydreaming Walter Mitty embarks on an adventure that goes beyond anything he’d previously imagined belongs to Conrad, as does the film’s subsequent exploration of a man rediscovering his adventurous spirit and lust for life. The Secret Life of Walter Mitty is Ben Stiller’s fifth feature film as a director and is a marked departure from some of his other directorial efforts (Tropic Thunder, Zoolander, The Cable Guy). While there are still glimpses of Stiller’s sense of humour – for example one of Walter’s imaginings is based on his misunderstanding of the plot of The Curious Case of Benjamin Button – in general the film has a more art-house tone. Stiller also demonstrates a much stronger visual aesthetic than you would expect from a filmmaker who is better known as a comedic actor. Stiller obviously allows the films content to influence its style, and thus this film about a man whose life has been devoted to a magazine and photographs is very intentional about presenting this story through both beautiful images and the interesting interplay of text and images. In the film’s title role, Stiller goes against his usual performative style, appropriately underplaying the character. Walter is the kind of person who blends into the background, who to the outside world is entirely unremarkable. Kristin Wiig, also better known for more outrageous comedic work, makes for a delightful love interest, and similarly impresses with her willingness to underplay. Shirley MacLaine is great as Walter’s admiring and supportive mother, as is Patton Oswalt who plays a phone operator at an internet dating site trying to help Walter flesh out his profile in an effort to attract more interest in the film’s primary running gag. Sean Penn only appears in one scene as the elusive Sean O’Connell but he owns that scene and reminds us of his ability as a comic performer. 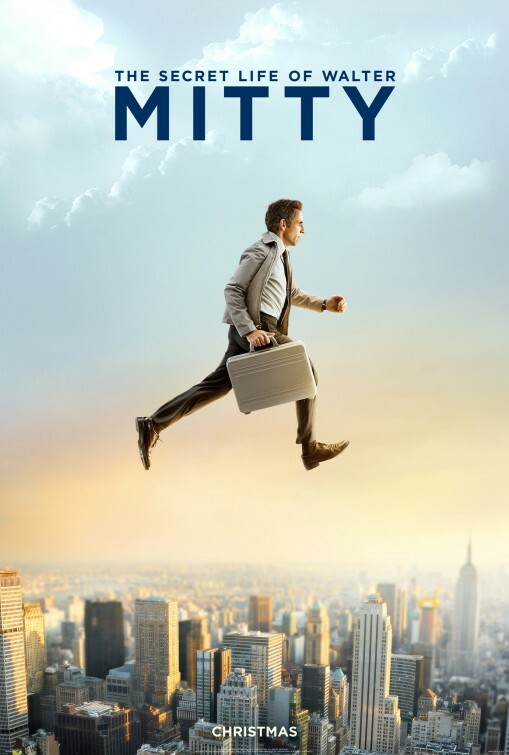 A far cry from the raucous comedies usually associated with Stiller and his Frat-Pack peers, The Secret Life of Walter Mitty is a whimsical, charming and above all tender film, and while it ventures into the overly sentimental it is so earnest that it is hard to begrudge it that. The Book Thief is a World War II film with a difference. It is a home front story set in Germany, telling the stories of the ordinary German people who had their country taken hostage by the Nazis. The film centres on nine-year-old Leisel Meminger. With an absent father, a mother who has been sent to a concentration camp for alleged Communists, and a deceased brother, she is adopted by Hans and Rosa Huberman. Teased at school for being illiterate, she starts learning to read with the help of Hans. At a Nazi book burning rally she steals away with a copy of HG Wells’ The Invisible Man and soon develops a passion for reading. In theory The Book Thief is a story of young people caught up in the horrors of Nazi Germany, but due to its point of view those horrors are largely absent from the film – this is a very PG treatment of World War II. That we see the world from the eyes of this young girl means that the scope of the film rarely extends beyond her immediate experience. So for the majority of the film there is no direct experience of combat, and while the Hubermans harbour a young Jewish man, it is never made explicit what they are hiding him from. As such, the film is very dependent on required knowledge to understand the stakes. Interestingly though, the most traumatic scenes in the film are those in which we see men and boys being conscripted into the Nazi army. For this young girl, largely unaware of the happenings of war, the most immediate effect of the war is watching friends and neighbours being taken away to serve. 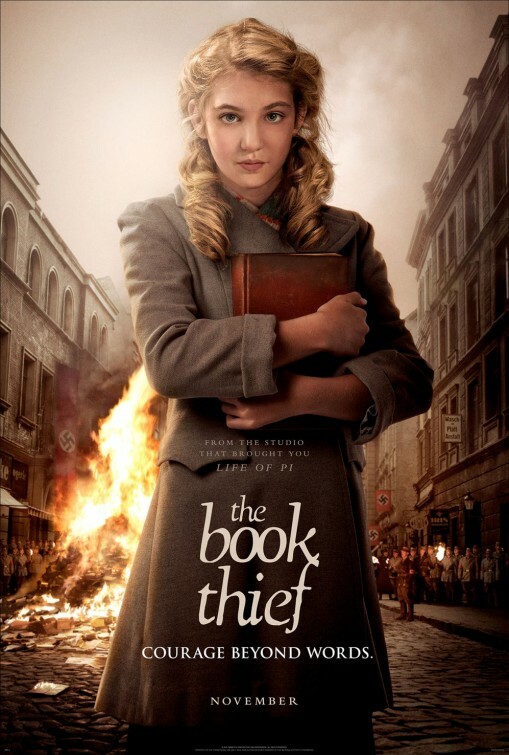 Based on the bestselling novel by Australian author Markus Zusak, The Book Thief is an example of why complete reverence to the source material should not always be the ultimate goal of a film adaptation. Like Zusak’s novel, the film is narrated by death, voiced by British character actor Roger Allam. While by all reports this device works in the novel, on screen it feels horribly gimmicky. Naff gimmick aside, it also simply isn’t good narration. The narrator has no consistent, meaningful presence. Instead the narration tops and tails the film, only appearing at a few moments throughout for unnecessary exposition. Simply removing the narration would have immediately improved the film, even if it meant being slightly less true to Zusak’s novel. Unfortunately though, the films narration is just one element of a poorly written, sappy and cliché ridden screenplay, ironic given the film is all about the power and importance of the written word – “words are life” Max declares. The film also takes an off-puttingly inconsistent approach to language. The film is set in Germany with all characters speaking English with German accents. This is a common device that allows an English speaking audience to understand what is being said while still maintaining the illusion that everything is happening in German. Except in The Book Thief there are also some moments where people speak in German with subtitles. The written word is such a prominent part of this narrative and similarly there is a mixture of words written in English and words written in German. This is not a major issue, but to those who notice it is an odd and unnecessary inconsistency. Geoffrey Rush and Emily Watson put in lovely performances as Liesel’s adoptive parents, and young Sophie Nélisse with her large expressive eyes is quite good as the film’s central character, but they alone cannot compensate for this film’s problems. The Book Thief may resonate with a younger audience but more mature viewers may become frustrated with its willingness to resort to cliché and its simplistic approach to a moment in history which, even given the films point of view, requires a more complex treatment. The Bard is back on the big screen and with this latest adaptation of Romeo & Juliet producer Ileen Maisel – the driving force behind the project – has opted for something quite novel, a traditional telling. In recent times the fashion when it comes to adapting Shakespeare has been to use contemporary setting and dress, but Maisel believed that modern audiences had not been exposed to a traditional, romantic vision of Shakespeare’s most famous play. It has, after all, been 45 years since Franco Zeffirelli’s famous adaptation, still a classroom staple. So director Carlo Carlei’s vision of the greatest love story ever told takes us back to fair Verona in Italy and delivers beautiful mediaeval costumes. 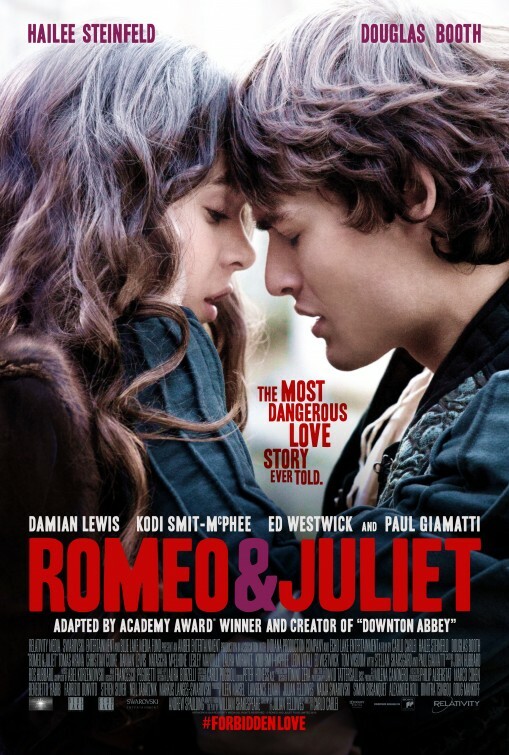 Romeo & Juliet assembles a reasonably strong cast of British and American talent. Unfortunately, the two leads don’t quite hit the mark. Hailee Steinfeld established herself as one of Hollywood’s most promising young actresses with her Oscar-nominated debut performance as the headstrong Mattie Ross in True Grit. However, she isn’t nearly as well suited to playing the sweet, innocent Juliet. British actor Douglas Booth, best known for his work in the mini-series Great Expectations, is a very pretty man indeed but also very bland. Kodi Smit-McPhee, on the other hand, is quite good as Romeo’s friend Benvolio and arguably would have made a more interesting and age-appropriate, if less dreamy, lead. Without a doubt though, the film’s scene-stealing performance is Paul Giamatti as Friar Laurence. Giamatti makes the Romeo’s counsellor and the young lover’s co-conspirator the most vibrant and emotionally engaging character in the film. While visually appealing, this largely uninspiring adaptation fails to unlock any new meanings in delivering the story to a new generation. It won’t have the cultural impact of Baz Luhrmann’s 1996 adapation, but could well become the go-to version for high school English classrooms around the world. Yann Martel’s 2001 novel Life of Pi was a best seller and much loved. However the story of a young man’s spiritual journey whilst stranded in the Pacific Ocean on a lifeboat with a Bengal tiger was considered by many to be unfilmable. But Ang Lee, director of Crouching Tiger, Hidden Dragon and Brokeback Mountain, has proven that with the right director there is no such thing as unfilmable, creating a piece of art that is both highly spiritual and visually breathtaking. I haven’t read Yann Martel’s novel so I can’t comment on how faithful an adaptation Lee’s film is, but I don’t really think it is important. I find it frustrating when people get hung up on the similarities and differences between novels and film adaptation and about which is better. A faithful adaptation of a novel does not necessarily make a good film. It is more important that the filmmaker use the novel as inspiration for his/her own take on the story. For example, Coppola’s The Godfather is a great film. Mario Puzo’s The Godfather is a great novel. But stylistically they are quite different, with Puzo’s novel being kind of pulpy, while Coppola’s film is grand and operatic. So its faithfulness to Martel’s Life of Pi isn’t as important as the fact that Ang Lee’s Life of Pi is a very good film in its own right. At the beginning of the film the writer tells the adult Pi that he has sought him out because he has been told he “had a story that would make me believe in God.” It is this spiritual element which differentiates Life of Pi from Robert Zemeckis’s Cast Away and other survival stories we have seen – that and the Bengal tiger. A very spiritual man, Pi sees his journey as having a spiritual significance that goes well beyond a simple fight for survival. Above everything else, Lee’s film looks amazing. Life of Pi is a stunning aesthetic achievement. With the use of digital technology Lee creates a heightened reality out at sea. Sometimes the sea is rough and choppy and looks very realistic, but at others it is so still and flat it is as though Pi’s boat is floating on nothing at all. This is one of the few films you should try and make sure you see in 3D. I’m not a huge fan of 3D movies, I think the vast majority of the time it is a gimmick used to inflate box office figures, but there are a handful of films which have really demonstrated the potential of the medium if used properly and Life of Pi is one of them. Equal to the visual achievement as the film’s overall aesthetic is the believability of the tiger, Richard Parker. At the end of the day, the success or failure of the film was largely going to be determined by how successfully Lee made you believe that you were watching a boy and a tiger together on a boat. Richard Parker is created almost entirely with CGI, a wise move as it means there is a consistent look whereas had they tried to use a real tiger as much as possible, there would undoubtedly been jarring moments which would draw attention to the CGI tiger. The computer generated tiger looks brilliant though. You never doubt the reality of the beast before you. Credit should also go to Suraj Sharma, whose performance opposite a CGI tiger is pivotal in establishing the believability of the animal. Life of Pi is a beautiful, thoughtful film which will be a definite player in the upcoming award season, particularly in the fields of visual effects, cinematography and directing.